Let’s face it, life is busy. Using our home space efficiently and keeping it organized and clean can save us so much time and money. We’ve rounded up 15 DIY organized home hacks to help us manage the chaos in your house. You’ll find ideas for a mobile laundry station, garage storage and organization, and tips and tricks for just about every area in your house from the kitchen to the bathroom! Your home will look amazing with these Awesome DIY Wood Pallet Ideas. Electrical cords keep us plugged into our favorite devices and household appliances, but they can certainly cause a lot of frustration! Just think of the last tangled mess you tackled trying to find which cord went with which device. 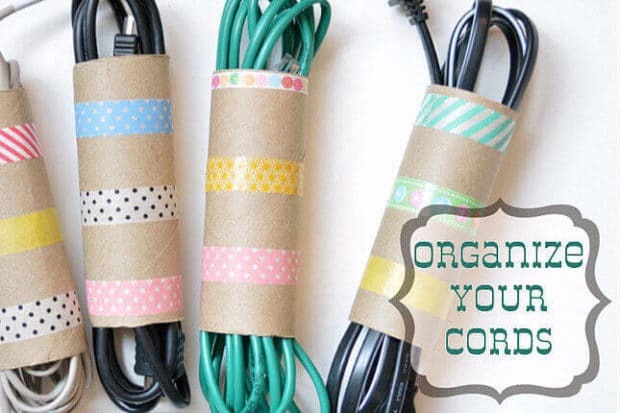 If you’re looking for a helpful house hack that will keep your cords organized and even a little less unsightly, give this washi tape cord labels idea a whirl! Your cords will be more easily identifiable and look pretty too! You just need a pen and washi tape in colors of your choice. Perhaps one of the most underutilized spaces in the house is the empty space underneath your stairs. This awesome house hack puts that space to use by creating pull-out storage shelves/drawers. Now you can put away holiday decorations, store extra craft supplies, or even house seasonal clothing that is not currently in use. 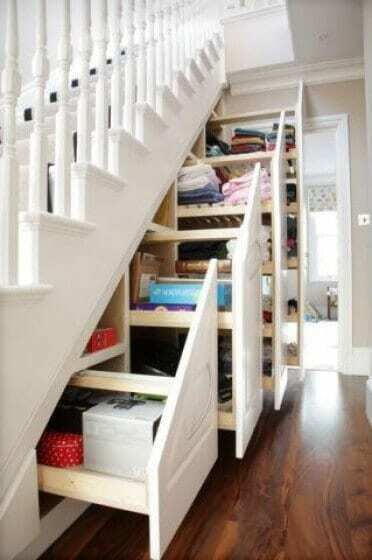 This idea for under the stairs storage is brilliant and can be used to store so many different things, keeping your main living space clutter-free! House cleaning isn’t the top of most people’s favorites list. It’s made worse when you have to spend precious minutes hunting for the right cleaning supplies or realize you’re out of the cleaning product you need! This handy shoe organizer can save the day and your sanity! 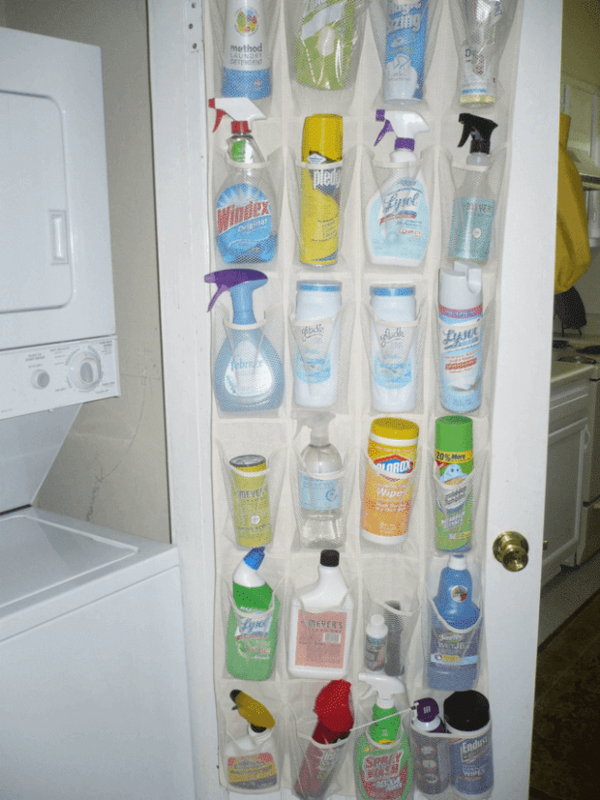 Just hang it in a closet and use the shoe pockets to store your most used cleaning supplies. This storage system keeps items nice and tidy, and from spilling! You’ll easily be able to find what you need for every dirty job in the house. When the cleaning supply runs out, you’ll know to replace it because the shoe pocket where it was stored will be empty. (You can label the supply pockets with the name of the supply.) Never waste time looking for cleaners again! Make the most of the small space under your kitchen sink with this space-saving hack! A simple curtain rod is used to hold a roll of trash bags, keeping them off the ground, and readily accessible. The supply list for DIYing this trash bag organizer is pretty straight forward. You’ll need some simple tools and supplies (pencil, level, screwdriver, measuring tape, saw, hand sander, spray paint, wooden dowel and curtain rod brackets. 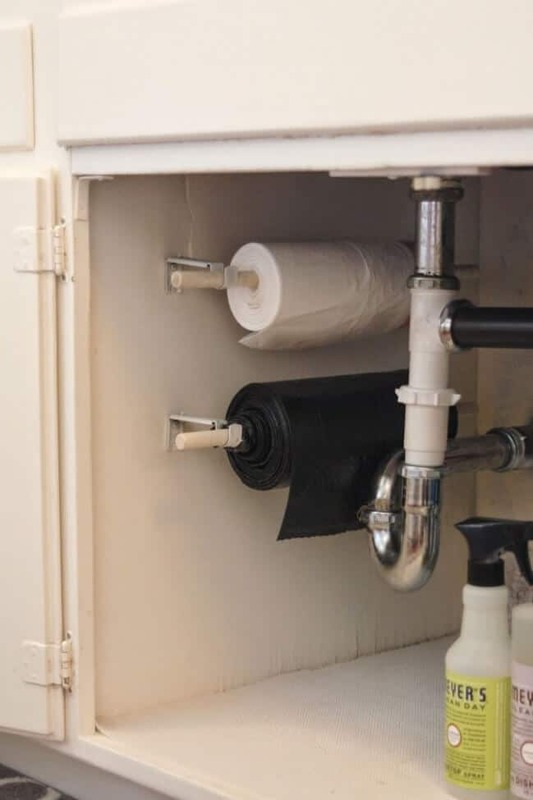 In a matter of minutes, you’ll have a tidy way to store your trash bag rolls while still keeping them in reach. Is your garage a chaotic pile of bike’s? 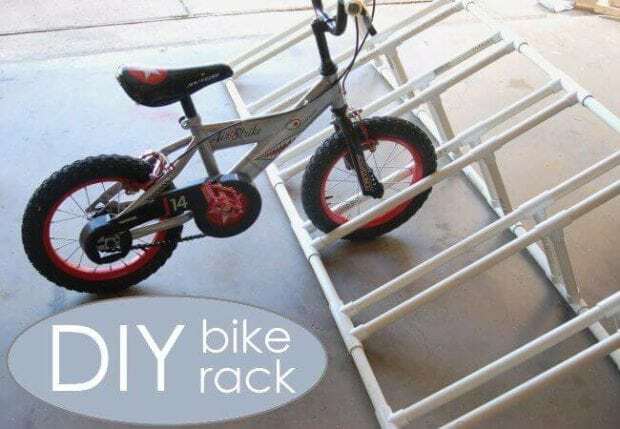 If you answered yes, this DIY PVC bike rack may just be the most awesome house (garage) hack you’ve ever laid your eyes on. You’ll love the simplicity of this project, and the fact that tools aren’t required, and the pieces don’t even have to be glued! You will need a combination of PVC pipe poles, T connectors, and insert connectors. This tutorial will walk you through the easy assembly. Are you ready to have your garage back? This bike rack may just be the solution to your crazy garage woes. 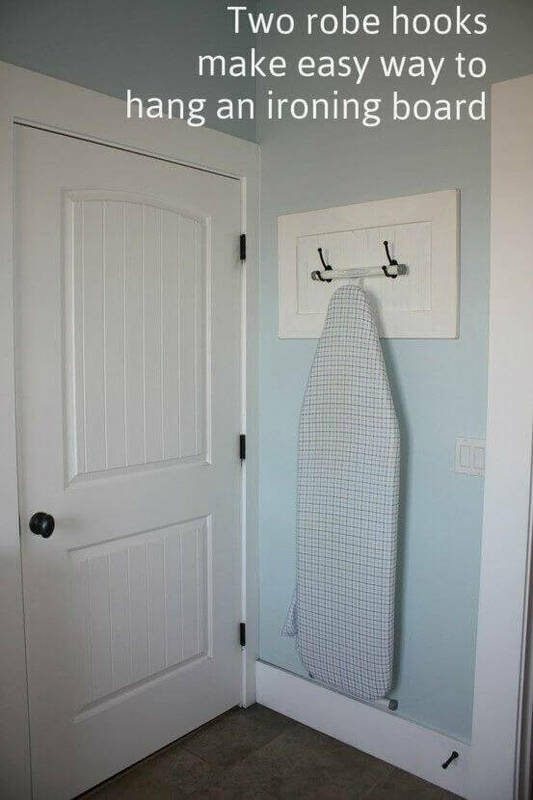 This ironing board hanger hack is going to change your laundry room organization! 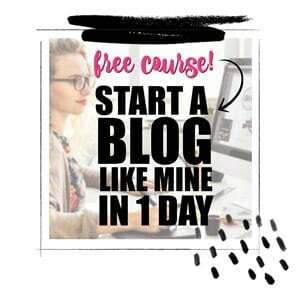 Are you ready for the how-to? Would you believe two robe hooks are the main materials for this awesome storage solution? Now you can keep that ironing board neatly stored away until you are ready to use it. Never search through your bathroom drawers for stray bobby pins again! 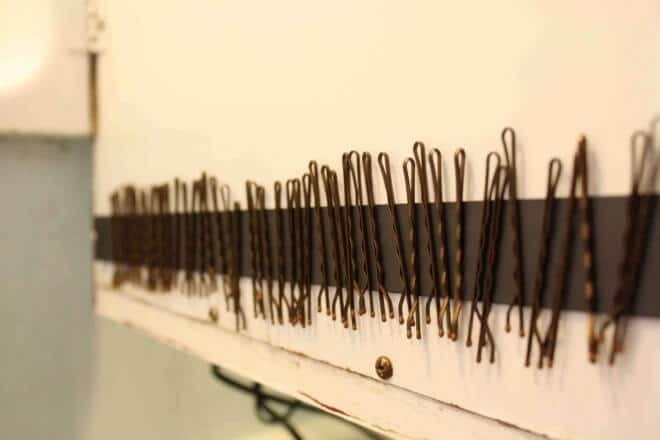 Purchase a roll of magnetic tape and create organization for your bobby pins! Simply attach strips of the magnetic tape to the insides of your medicine cabinet or bathroom cupboards. Not only will the strips store bobby pins and make them easy to put away and find, you can also store things like tweezers and fingernail clippers. Laundry. It’s never ending. 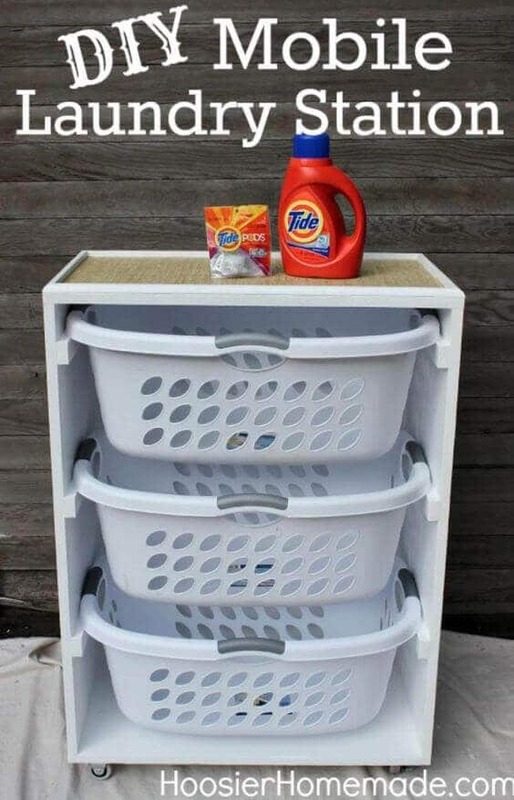 With this DIY mobile laundry station you have an area to store laundry supplies like detergent, bleach, stain removing agents, and fabric softener. You also have 3 bins for easy sorting. This mobile laundry station helps keep dirty clothes organized for an easier solution for tackling the loads. Check out the supply list and DIY directions for building your own. Create your own comfy and cozy place to sit and read books that also acts as a hideaway storage solution! This bookshelf storage bench is made from an IKEA Expedit shelving unit, IKEA Capita legs, some MDF, quilt batting, decorative fabric, staple gun/staple and foam. It’s totally no-sew and can be put together in just a couple of hours of time following this step-by-step tutorial. 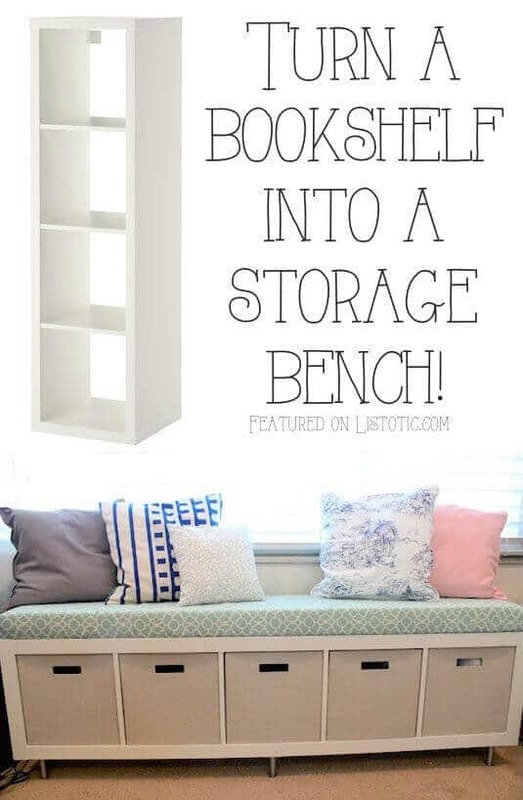 We’re certain this this bookshelf storage bench might just become the favorite place to daydream in the entire house! 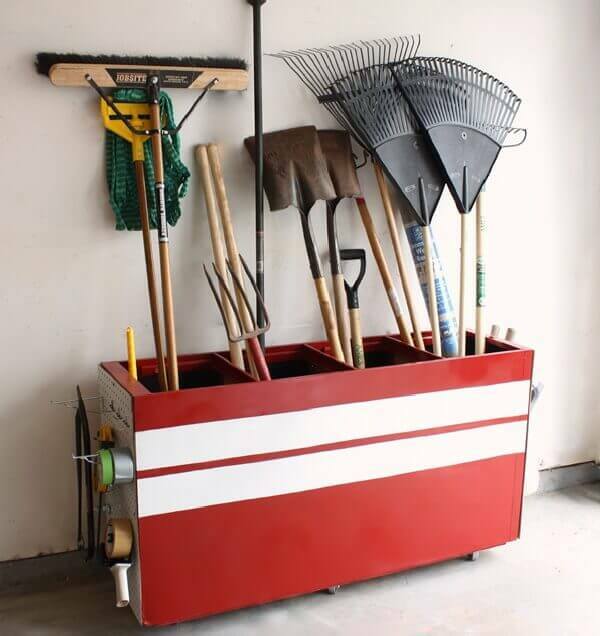 Turn an old or unused filing cabinet into awesome garage storage! Simply remove the drawers from the filing cabinet and turn it on its back. Add coaster wheels, pegboard to the sides for small tool storage, and give it a fresh coat of paint. 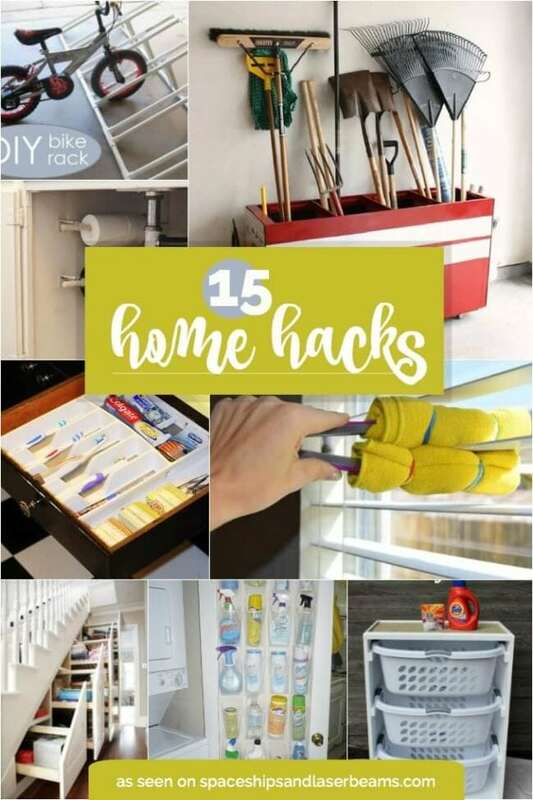 Use the open slots where the drawers used to be to store a variety of tools—rakes, shovels, brooms, hoes, pitchforks, etc… You’ll have your garage organized and in tip-top shape in no time. 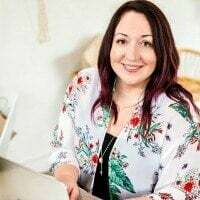 If you’re like many people, the sight of cords drives you crazy, especially during the Christmas season when fireplace mantles are decked out in greenery and holiday lights. 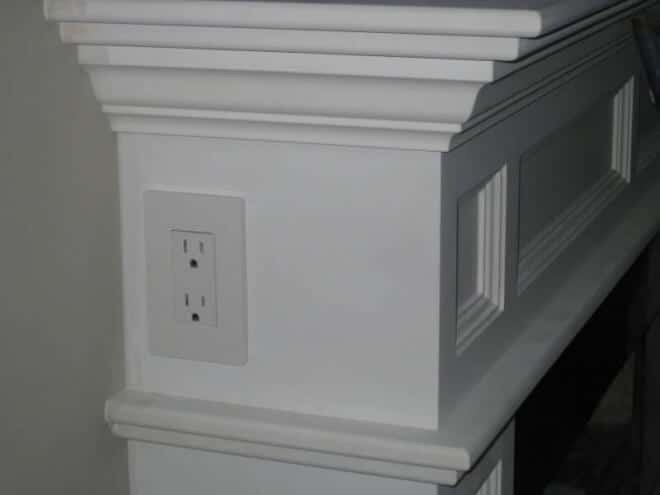 With this awesome house hack you can hide those pesky cords by having an electrical outlet installed in your fireplace mantle. Unsightly cords won’t be an unwelcomed guest come holiday decoration time this year! 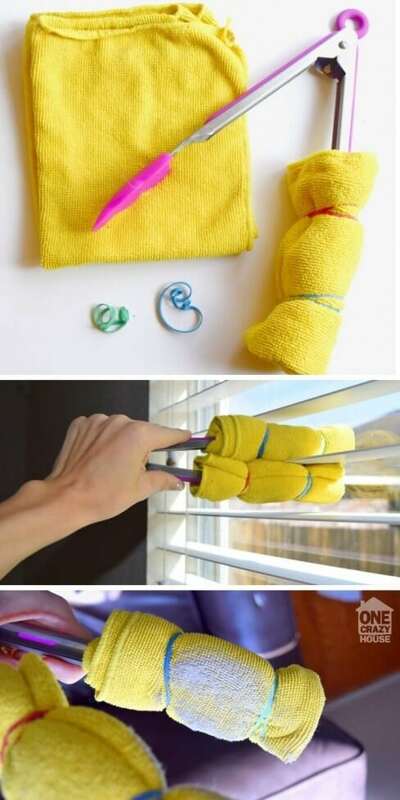 Cleaning your blinds can be so tedious. Get ready to have your mind blown by this genius DIY blind cleaner hack that will save you time! You’ll need a few supplies first: a pair of tongs, two microfiber dust cloths and 4 rubber bands. Follow the easy instructions to DIY the cleaning tool, and get ready for the most efficient blind cleaning hack ever! When was the last time you actually washed your washing machine? If you’re like most people and haven’t, try this DIY washing machine cleaning hack only requires 3 materials: bleach, white vinegar, and a microfiber cloth. Grime be gone! 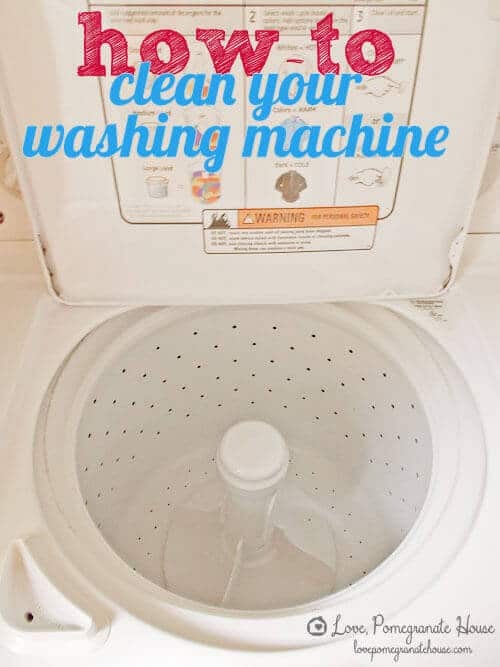 Whether you clean your washer the recommended twice per year or more often, you’ll be amazed by how much cleaner your washing machine is after using this cleaning hack! If your toothbrush drawer in your bathroom could use some organizational help, we’ve got an awesome hack to share! 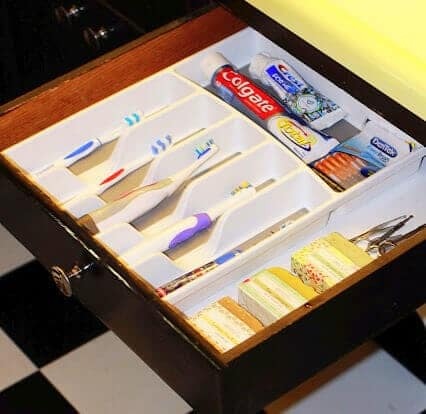 Transform an ordinary cutlery caddy into a toothbrush drawer organizer. You can label each silverware slot with the name of a family member to show where their toothbrush can be stored. Use the other areas of the drawer to store such items as toothpaste, floss, and mouthwash. Say goodbye to tangled cords with this easy toilet paper roll cord organizer. You’ll need toilet paper rolls, decorative tape, and a marker or pen to create a label for your cord storage. Simply roll up the cords, slide into the decorative toilet paper roll storage solution, and label the cords with their use. Don’t deal with the mess of tangled cords any longer! Keep your home organized with these great sources gathered by the team at Spaceships and Laser Beams. Check out these great ideas for more organization ideas.